Troy Jern Assistant Fire Chief of the Oquawka Volunteer Fire Dept. invited me to stop by the fire house recently as they were going to be practicing several rescues using the Jaws of Life. I arrived to find the station house filled with people and the firefighters dressed out in their suits and equipment. There were men women and children filling almost every chair in the room of the Oquawka Fire Station. There were more than thirty-five people involved, and according to Troy, that was only about half of the force. This training session for volunteer firefighters and rescue workers, is similar to what other communities experience in almost every town and city across our nation. It is the gift of time that is absolutely necessary for a community's well being and sense of security. It's after a full day of work, maybe a quick bite to eat, and than off to the fire station for several hours of donated time to the community. It is also, never ending training, from initial qualification to advanced procedures, which is a constant of learn, practice, do, than practice even more. On the night I was there to witness these dedicated volunteers, I witnessed two things that were going on. One was the ongoing initial training for a group of 13 new EMS Volunteers who were in their seventh week of training. The other was live training using the jaws of life to extract real people from simulated wrecks for the ongoing training of firefighters and for all rescue personnel. Training began with classroom instruction emphasizing situational awareness and emergency tools for vehicle rescues. The second part of training was using actual vehicles. Grays Automotive had donated two cars for the exercise. Everyone headed up to the Eagle Club parking lot in Oquawka for the training. 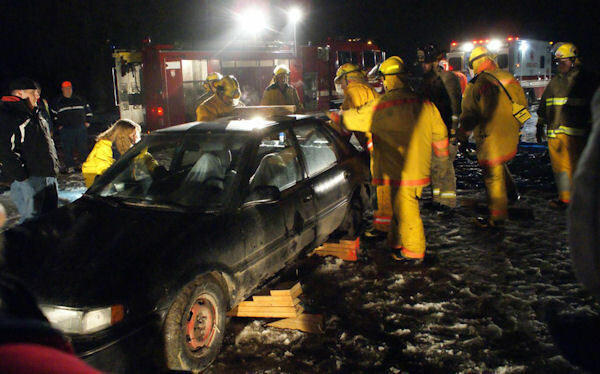 It was a wet, slushy muddy night and fire trucks, and ambulances, all went into the mud for the sake of training. Equipment was made ready imitating a real rescue. Two young teenage girls served as victims that were almost too much like real life. The exercise would teach the skill of saving lives to these trainees, as well as providing hands on training good for even the most seasoned veterans. "Fire Truck" is often one of the first words spoken by children. "Hero" is often the first word that comes to mind when asked what a fire fighter is to a community. Much of this story is inspired by a special documentary presented by Tom Brokaw during the Olympic coverage. It was about a community in Canada embracing Americans stranded due to 9/11. One of the most inspiring stories was of a young firefighter and how his life had come to touch the hearts of thousands. His parents had been returning home from Europe when the Towers had fallen, and their airplane had been diverted to Nova Scotia where they would be stranded until the skies were once again free to fly. They had shared their concerns about their firefighter son with their Canadian hosts and the story had gotten out and had become one that held the thoughts of two nations sharing in a family's worry. The story began with the dream of a young man, and his determination to achieve it, how prayer had been a part of his journey, the shared waiting of thousands who would be all touched by what would become of this families, Firefighter Son. When it was determined that he had died along side of so many other rescuers doing their job, it became a personal loss to everyone who could not help but be personally touched by both this families sadness and pride. He gave his life along with countless hours of training that go towards moments of life and death decisions and actions. Self-satisfaction of saving a business, a home, a life, and the esteem of their neighbors as reward for much risk and effort is the goal of this selfless volunteers. And how often goes unseen is the thousands of hours of family time sacrificed while a spouse is serving the community. Midnight sirens passing in the night with but a moments distraction from our warm bed. 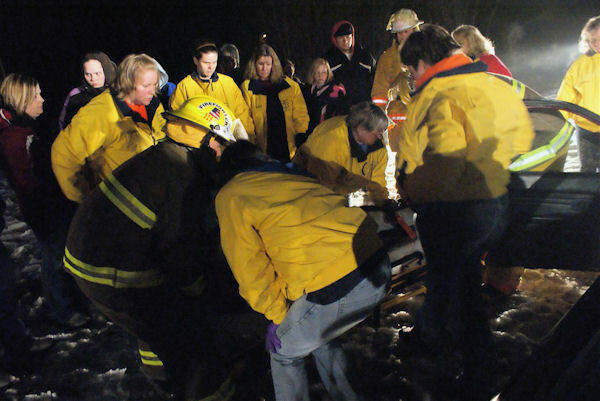 A neighbor or friend is saved from burning, pulled from a wreck, or resuscitated from a heart attack, while the family of the rescuer worry and pray. The Treasure that these professionals bring to each of us, is that indescribable hand that saves.